Lakeview College of Nursing (LCN) awards the Bachelor of Science in Nursing Degree upon recommendation by the faculty and presentation to the Board of Directors after the student has completed the degree requirements. All students must be making satisfactory progress to remain in attendance at the College. All courses attempted in a specific semester or comparable time frame will be used to measure academic progress. Course withdrawals may affect academic progress if the hours earned do not meet the criteria for quantitative and/or qualitative measures for satisfactory progress. Not meeting satisfactory academic progress will have an adverse effect on student aid eligibility. Note: All students are required to meet the same minimum Standards regardless of eligibility for Title IV funding. Lakeview College of Nursing (LCN) Office of Financial Aid is required by Federal regulation (HEA Subpart B, 34 CFR 668.16(e), Subpart C, CFR 668.32, 668.34, 668.42, 668.43) to monitor academic progress toward a degree for all degree-seeking aid applicants. As a result, the Office of Financial Aid receives from the Records office the academic history of all attempted credit hours of all applicants prior to the awarding of Title IV Federal Student Aid and/or Illinois State Student Aid. These standards must have components of a Quantitative Measure (the Pace at which the student must be completing their Program of Study) and a Qualitative Measure (the grades a student must be obtained in their coursework) and be reviewed at stated intervals. At LCN SAP is reviewed at the end of each enrollment period for all students. Completion of a minimum of 120 semester hours credit with at least 60 semester hours in general education courses and 60 semester hours in nursing courses in accordance with the curriculum plan is required. All grades earned in courses taken while a student is enrolled at the College will be used as the criteria for determining academic standards. The student is required to meet the standards listed below or otherwise eligibility to receive student financial aid will be placed in a Academic Probation/Financial Aid Warning status (the first time the minimum SAP is not met) or an Academic Dismissal/Financial Aid (SAP) SUSPENSION status or a Financial Aid (SAP) PROBATION status (if a formal Appeal is approved and the student is readmitted). To be in SAP “GOOD ACADEMIC STANDING” a student must be meeting the minimum standards each enrollment period by having and maintaining a cumulative G.P.A. of 2.5 and not exceed the permitted number of withdrawals and/or failures to avoid academic dismissal (financial aid suspension) and complete their program of study within the published time frames formatted in credit hours. Cumulatively a student must successfully complete a minimum percentage of all credit hours attempted to stay on pace for completing their program before reaching the maximum time frame allowed. Attempted credit hours include any credit hours in which the student was enrolled in after the refund period is over. If the student accepted Federal Title IV aid for days attended during the refund period (tuition and fee charges are canceled) but then totally withdrew from all credit hours the student will be placed on SAP Suspension. However, this action will not result in Academic Dismissal but the student would need to reapply for admission to the college and submit in writing a SAP Appeal that has Committee approval to be reinstated for student aid eligibility. 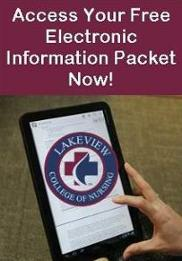 Once a student enrolls in a course at Lakeview College of Nursing, the degree requirements must be completed within three consecutive academic years for a fulltime student and six consecutive academic years for a part-time student. Completion time may vary for students changing from full-time status to any other status, and/or withdrawing from courses. A student will never have more than six years to complete the BSN degree requirements. Successful completion of a class is a letter grade of “A”, “B”, “C”. Unsuccessful completion of a class is defined as “D” (Poor/Failure), “F” (Failure), “W” (Withdrawal), or “I” (Incomplete) on the semester grade report. Please note: Successful completion of N210 Foundations of Professional Practice is a letter grade "A' or "B". Any student receiving a "C", "D", "F" or "W" must retake the course. A student who receives a “D,” or “F” or "W" for a course must retake that course the next semester it is offered. In the second time through a course, students must receive at least an overall grade “C” to pass the course and not be dismissed. Exception -- N210 must be passed with an "A" or "B". A student may only repeat a course one time in which they received a grade of “W” or failing grade. Any student who has withdrawn from one course will be placed on academic probation/financial aid warning. A student withdrawing from two different courses will be dismissed from the College. A student may not withdraw from more than 1 course while pursuing the BSN degree. The student may not withdraw from a course if there is a Student Code of Conduct issue or a Grievance is pending or being investigated. Minimum Percentage - A student is expected to complete all credit hours attempted to be on pace for completion of program. The first time a student fails to complete progression standards they must be placed on Academic Probation/Financial Aid WARNING for the next term of enrollment. Minimum Grade Point Average (GPA) Requirement (Qualitative Measure) - The student is required to earn and maintain a 2.5 Cumulative grade point average out of a possible 4.0 scale. All LCN grades and all semester hours count on the student’s grade point average in determining scholastic eligibility to remain in the College. A student must earn a minimum of “C” in each LCN course with the exception of N210 Foundations of Professional Practice. Academic Probation/Financial Aid (SAP) Warning status occurs the first time a student fails to meet the minimum standard in any one of the components. If a student is placed on Academic Probation/Financial Aid Warning they will still be eligible to receive Student Financial Aid for one more term without appealing the circumstances. All grades earned within the nursing curriculum while a student is enrolled at the College will be used as the criteria for determining academic probation. Any student placed on Academic Probation/Financial Aid Warning for unsuccessfully completing a course MUST take the failed course in the next semester it is offered (summers excluded). Although an effort will be made to meet the needs of students who retake courses, enrollment is dependent on the number of students who can be reasonably accommodated by the available facilities. A student required to repeat a course must do so at LCN. Courses taken at another college or university may not be used to repeat LCN courses unless specific approval from the Dean of Nursing and Course Coordinator is obtained and placed in writing in the student's file. Repeating a course in which a "D" or "F" was received does not remove the grade from the transcript. The second grade earned is calculated into the GPA. A student on academic probation/financial aid warning (below a 2.5 cumulative GPA) who does not show progression by raising the student's LCN semester GPA the next semester enrolled. A student who has failed (D, F or W) a nursing course and fails it again (D, F or W). A student who failed (C [if admitted Fall 2015 or later], D, F, or W) in N210 Foundations of Professional Practice and fails it again (C, D, F or W). A student who fails two different nursing courses. A student who has withdrawn from two different courses. If upon the end of the student’s next period of enrollment they have not met the minimum standards they will be in an Academic Dismissal/Financial Aid Suspension status. A student placed on Academic Dismissal/SAP Suspension is NOT eligible for Federal and/or State student aid at Lakeview College of Nursing. Financial aid can be reinstated if a student is successfully readmitted through the appeal process (see readmission). Also, total withdrawal from all courses (a “grade” of “W” posted to transcript) or total failure from all courses (a grade of “D” or “F” posted to transcript or if grade of “C” is earned in N210 Foundations of Professional Practice) will result in Academic Dismissal/Financial Aid SUSPENSION. This includes the refund period if Title IV was accepted for the days you were in attendance (regardless if tuition/fees were canceled).